When I tell friends and family that I’m going back to volunteer in Calais they always ask me why? They don’t understand. They say The Jungle doesn’t exist anymore so what’s the need? Well let me tell you about the need. The Jungle had a population of over 8000 people and when the camp was cleared, where do you think all those thousands of people went? They all dispersed and now live in underpasses, roundabouts, industrial estates and any land they can find. They are constantly being moved by French Police and most of them don’t know when their next meal will be. Right now the weather in Calais is less than 10 degrees during the day and even lower at night. This weekend I met several young men wearing t-shirts and thin jumpers – they did not have proper coats and it was just starting to rain. I was so glad we were able to get warm waterproof jackets for them, but sadly I know there are nowhere near enough for everyone and it’s only going to get colder. We really need everyone to look in your cupboards and closets for winter coats that you no longer wear and send them to us. If you can’t do that you can donate below to help us buy one. 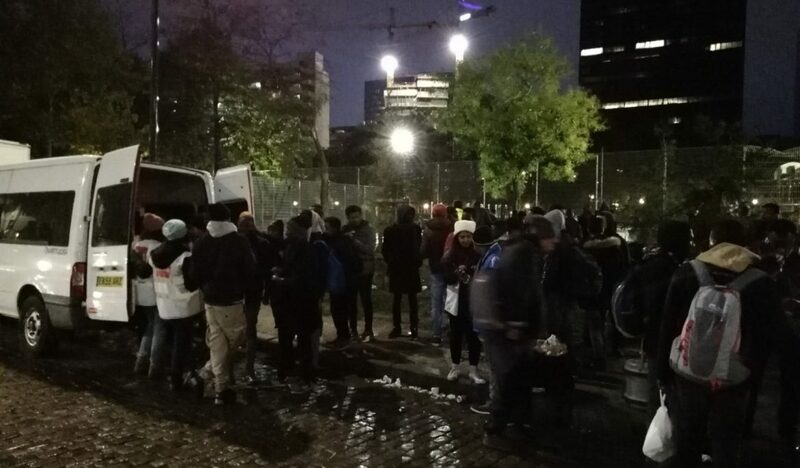 Please visit https://care4calais.org/ to see how you can help!